Hungarian prosecutors said Friday that Dan Tan, a notorious Singaporean alleged match-fixer wanted around the world, was charged in absentia along with 44 others suspected of manipulating football matches. The 45 including Tan Seet Eng, better known by his pseudonym Dan Tan, were indicted on Thursday after a four-year probe into the alleged manipulation of 32 games across Hungary, Italy and Finland. The others, all Hungarians, include former players, players still active, referees, club owners, managers and coaches. Geza Fazekas, spokesman for Hungary's chief prosecutor's office, told AFP on Friday that four separate trials would be held due to the large number of people and matches involved. "The main trial will involve the organisers and ringleaders, those who were liaisons with the Asian syndicate," he said. "The (36,000-page) report has been filed with the Budapest court now, so we estimate trials should begin within months, probably no later than September." European police body Europol said in February that hundreds of games worldwide had been targeted by match-fixers linked to crime syndicates in Singapore. European and international arrest warrants have been issued by Hungary's prosecutors for the elusive Dan Tan, but he remains at large. The suspects face sentences ranging from two to 16 years in jail if convicted. The other three trials will deal with cases where players in Hungary acted independently of the Asian syndicate, or where a large number of players from the same club were implicated, for example the REAC club in Budapest, 14 of whose players or former players have been charged. Describing the syndicate's methods, a statement Thursday from Imre Keresztes, Hungary's chief prosecutor, said the goal of the match-fixing ring was to select matches worldwide in which there was a "realistic chance" of manipulating the result via bribing referees or players, in particular defenders. Large quantities of low-level bets, usually around 100 euros ($130), would then be made in betting shops around the world. The 32 games under suspicion include Hungarian league and cup matches, domestic and international youth matches which took place in Hungary, three top league games in Finland, and one in Italy. Two international friendly matches between clubs are also being investigated. Michel Platini, the president of European football's governing body UEFA, on Friday said match-fixing and betting was "the main problem" facing football. "We are not dealing with petty criminals looking to make ends meet," said Platini at the UEFA congress in London. "It seems that we are in some cases dealing with mafia-type organisations that use some games, and therefore our sport, to launder dirty money. "One game rigged is one match too many as it strikes at the soul of our sport, the very essence of the game." Platini also called for the creation of a Europe-wide organisation to police sport. 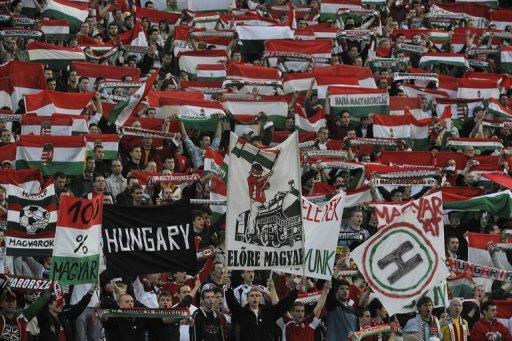 Hungarian fans celebrate at Puskas stadium of Budapest on April 1, 2009. Hungarian prosecutors said Friday that Dan Tan, a notorious Singaporean alleged match-fixer wanted around the world, was charged in absentia along with 44 others suspected of manipulating football matches.